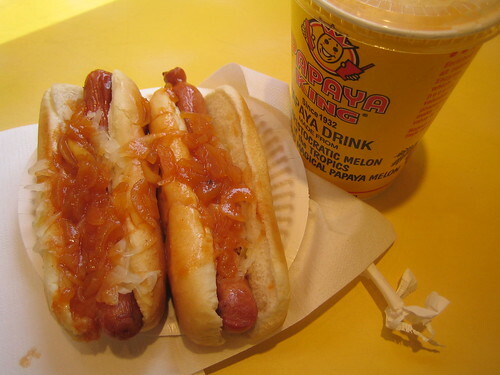 My meal from Papaya King, 2 ‘Home run’ hot dogs (a dog with sauerkraut and onions) and a Papaya drink. The story of Papaya King is a long one, and I don’t have the patience to go into it, but content yourself with this piece of knowledge: the best Papaya and hot dog combo is Papaya King on 86th and 3rd Ave. Grey’s Papaya is the red-headed step-child in comparison. The Papaya drink is billed as an aid to digestion, which is needed after eating these two hot dogs. By the way, for those of you not from NYC, that reddish stuff on the hot dogs is onions. It’s a NYC thing. Puppy Pops are some popular frozen treats for dogs at the Dairy Godmother. Banana and pumpkin flavors. I’ve been told pumpkin is good for a dog’s digestion. They don’t just sell tasty frozen treats for humans at the Dairy Godmother.